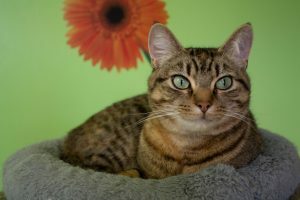 AGE: Bella is an appealing 2-year-old brown Tabby and Tortie girl. She has been at the shelter for three months and is SO ready to find her real home. PERSONALITY: Bella was pretty timid at first because everything was new and she was scared. Now though, after discovering that the people she sees every day really care about her, she has become more social and open to petting. HIGHLIGHTS: She enjoyed having a little girl read to her at the shelter’s “Read to a Kitty” day, and she LOVES playing with wand toys! Bella likes to be approached slowly, and so far she’s not much of a lap cat, but that could change with cat-savvy people in a new home where she is given lots of time to adjust. If you have a loving quiet home for beautiful Bella, she might just blossom into your new best friend. AVAILABLE: At the Jackson County Animal Shelter, 5595 S Pacific Hwy, Phoenix. Open 11am to 4 pm Tuesday through Friday, and noon to 4pm weekends. COST: Bella’s adoption fee is only $50, and includes a free wellness visit at a local veterinarian office. Bella is spayed. LOST & FOUND: www.petharbor.com or call 541-774-6654. OTHER RESOURCES: Southern Oregon Humane Society, www.sohumane.org; C.A.T.S., www.kittensandcats.org; Sanctuary One, www.sanctuaryone.org; Spay/Neuter Your Pet (SNYP) – low-cost options; www.spayneuter.org.